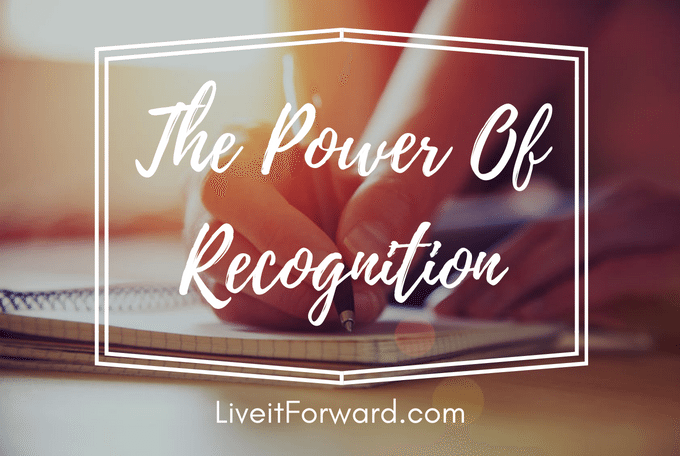 There is one thing everybody deserves in life: recognition. In fact, the smallest amount of recognition can leave an imprint on someone that lasts forever. Helen P. Mrosla, a teaching nun, wrote a story of an experience that shows just how powerful recognition can be. Here is her story, taken from the book Becoming a Person of Influence by John C. Maxwell and Jim Dornan, pages 44 – 46. One Friday (in the classroom) things just didn’t feel right. We had worked hard on a new concept all week, and I sensed that the students were growing frustrated with themselves—and edgy with one another. I had to stop this crankiness before it got out of hand. So I asked them to list the names of the other students in the room on two sheets of paper, leaving a space between each name. Then I told them to think of the nicest thing they could say about each of their classmates and write it down. It took the remainder of the class period to finish the assignment, but as the students left the room, each one handed me their paper…. No one ever mentioned those papers in class again. I never knew if they discussed them after class or with their parents, but it didn’t matter. The exercise had accomplished its purpose. The students were happy with themselves and one another again. That group of students moved on. Several years later, after I had returned from a vacation, my parents met me at the airport. As we were driving home. Mother asked the usual questions about the trip: How the weather was, my experiences in general. There was a slight lull in the conversation. Mother gave Dad a sideways glance and simply said, “Dad?” My father cleared his throat. “The Eklunds called last night,” he began. Dad responded quietly. “Mark was killed in Vietnam,” he said. “The funeral is tomorrow, and his parents would like it if you could attend.” To this day I can still point to the exact spot on 1-494 where Dad told me about Mark. I had never seen a serviceman in a military coffin before. . . . The church was packed with Mark’s friends. [His old classmate] Chuck’s sister sang “The Battle Hymn of the Republic.” Why did it have to rain on the day of the funeral? It was difficult enough at the grave side. The pastor said the usual prayers and the bugler played taps.One by one those who loved Mark took a last walk by the coffin and sprinkled it with holy water. I was the last one to bless the coffin. As I stood there, one of the soldiers who had acted as a pallbearer came up to me. “Were you Mark’s math teacher?” he asked. I nodded as I continued to stare at the coffin. “Mark talked about you a lot,” he said. What would make so many adults hold on to pieces of paper they had received years before as kids, some of them carrying those pages with them everywhere they went — even into battle in a rice paddy halfway around the world? The answer is appreciation. Everyone is incredibly hungry for appreciation and recognition. Need some encouragement and hands-on tools to move from DREAM to DO in the most important roles of your life? Check out Then the Live It Forward Show is exactly what you’re looking for! Subscribe on iTunes, Stitcher, Android, or Google Play to get automatic updates.